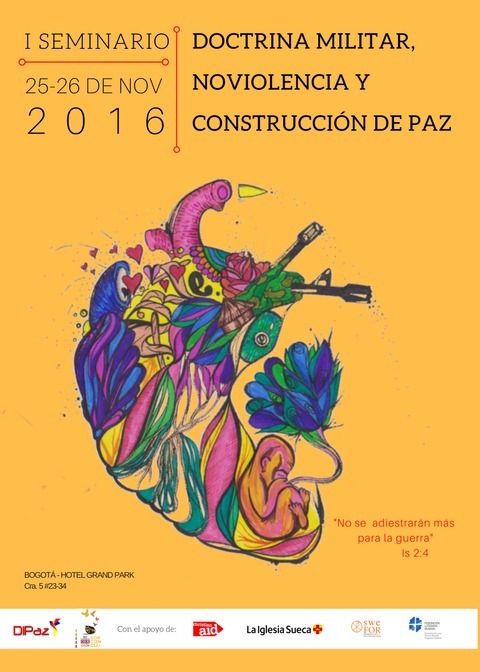 In light of the approved peace agreement between the Colombian Government and the FARC (Revolutionary Armed Forces of Colombia), DIPAZ (Inter-church Dialogue for Peace) held an important conference on Colombia’s military doctrine and non-violent grassroots efforts. and member of the Emmaus Lutheran Church in Medellin. Colombia practices obligatory military enlistment for all males 18 years old. It is almost impossible for young men to find legitimate work or enter into university or higher education without being able to present the document demonstrating that the service has been completed. There is, however, the possibility of declaring oneself a conscientious objector based on religious beliefs. It is a long and difficult process, but many have done it. This DIPAZ conference was based on the idea of conscientious objection. However, it also was looking for and defining other possible paths towards the demilitarization of the country and its culture...the idea of a non-violent lifestyle. As Colombia looks forward to building peace after more than 50 years of armed conflict, this is a very important issue, and one of the pillars my work here, as well as that of DIPAZ. introducing the second day of the conference. Photo by Curtis. The participants of the conference were asked to bring a symbol of their peace-building work. To start the conference they presented their symbols and placed them in the center of the room.